I've also been obsessed with making jewelry lately. :) The set you see above is a gift for my friend tonight, too. I think what I love about both jewelrymaking and soapmaking is that the possibilities are pretty endless... the only limit if your own imagination! I drool over the aisles of beads in my local craft stores, and the abundant selection of beads available online. It can be mind-boggling sometimes. I really have to make an effort to be focused on just one project and not oogle over every pretty bead I see. :) One of the memorable moments from my recent trip (which I have yet to blog about... I know, it's coming!) is teaching my mom some jewelrymaking techniques. 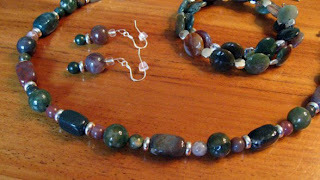 She had some wonderful ideas, and her style is a bit different than mine, so it was interesting to see the beautiful jewelry sets she put together after learning the basics. :) It was great mother-daughter time. This last one I throwing in just so I don't feel too guilty about sharing my crafts on my food blog. 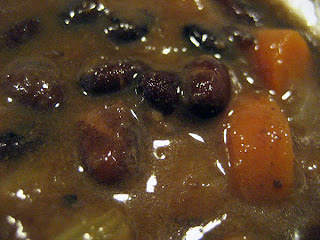 ;-p For lunch today, I brought along Whole Foods Market's 365 Organic Black Bean Soup, which is vegan. I don't know if it's my favorite black bean soup, but it was a yummy and quick meal. At 150 calories and 1 gram of fat per serving (two servings per can), it was a healthy lunch as well. How good you are to your friend! 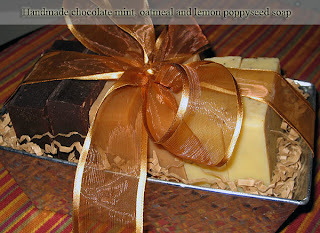 The chocolate soap sounds brilliant! I don't think you should worry about mixing in craft posts, I really enjoyed the post. Sometimes your blog can evolve anyway, it keeps things interesting! the soap is beautiful and sounds delicious. and you make your laundry soap...wow!